The Great Lakes Brewing Co. is a brewery and restaurant in the city of Cleveland. They started off in a little shack making some decent brews in 1988 and eventually expanded into a six building compound in west Cleveland. I visited the brewery recently and being restricted by age from hanging out in the tasting room with all the other snobs, stood outside and admired the what looks like 200 year old building from the side walk. oh well. 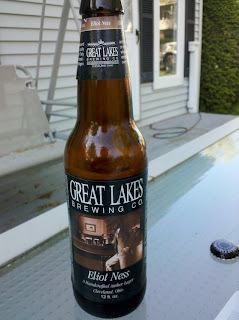 This lager gets its name from the legendary, mobster slaughtering Eliot Ness. Ness was the leader of the Untouchables, a group of government agents who hunted down all the freedom loving bootleggers who only wanted to make some booze for their parties. History lesson aside, this brew is good drinkin! It enters your mouth with the rich, malty flavors of a lager and trickles down your throat leaving a pleasant, hoppy and fruity aftertaste. It's as smooth as the Cuyahoga I tell you. Cuyahoga pre-pollution ridden/catching on fire of course. It's not too heavy of a lager and is definitely something I could drink twelve of at an outdoor gathering. There's an awesome picture of a guy pretending to be Eliot Ness on the bottle. Decked out with a fedora and grasping a mug of brew. I think there may even be a cigarette hanging out of his mouth. It's $9.50 for a six pack at the local Giant Eagle. But I suppose I could get it for four bucks cheaper anywhere else. dont forget to add your tags, rook.